The National Council For Hotel Management & Catering Technology (NCHMCT), Is Holding The National Hospitality Teachers Eligibility Test (NHTET), So Interested Indians Can Apply For This Through Online Process Within The Given Time Period. National Hospitality Teachers Eligibility Test 2019, Kindly Go Through The Image's Below For Important Dates, And Examination Centres. B. Eligible Criteria For NHTET 2019 Notification. Age Limit →Candidates born on or after the following dates are eligible to apply: General Category - 30.09.1989 OBC Category - 30.09.1986 SC, ST & PD Categories - 30.09.1984. Educational Qualifications →Full time Bachelor’s Degree in Hospitality Administration/ Hotel Management after 10+2 from a recognized University with at least 60% marks and at least 2 years Hospitality Industry Experience after obtaining Degree. OR Full time Master’s Degree in Hospitality Administration/ Hotel Management after Bachelor’s Degree in Hospitality Administration/ Hotel Management from a recognized University with at least 60% marks either in Bachelor or Master’s Degree. Mode Of Examination/Selection Process →Based On NHTET Selection Procedure. Online Application/Examination Fee →ON- LINE APPLICATION FEE : Rs.800/- for General/OBC categories(male candidates only) And Rs.400/- for all female candidates as well as SC/ST/PD categories(fee can be revised in future NHTET) to be submitted along with the print out of the confirmation copy of the duly filled in and on line submitted application form. Last Date For Online Application Form Submission →3rd Of May, 2019. Admit Card Download →Check Out The 2nd Image Above. NHTET Exam Date →Again Check Out The Image Above. 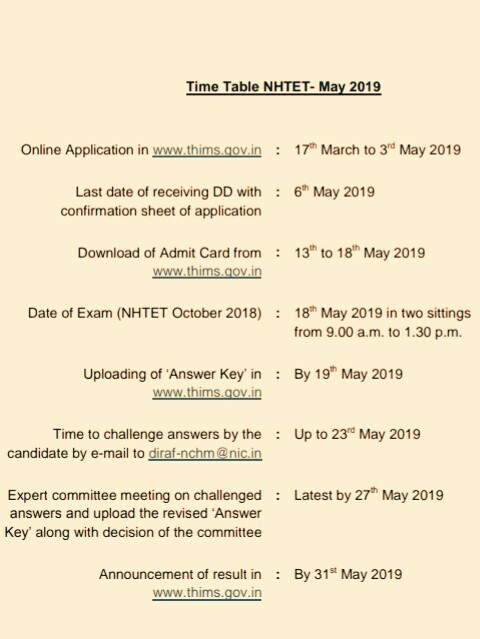 Now Apply For NHTET Exam 2019.